Hello everyone. The past two days I’ve fixed errors in the navigation (two game reports were inaccesible) and improved the right navigation that pops up on multi-page-articles. Now its possible to jump back from there to the category the article is placed in, and additionally I’ve increased the width of the column to include longter headlines. Looks good to me. my attempt in integrating a lightbox has been thwarted tho by an JS-Error that places the full-size image at the end of the page instead of opeing the lightbox. Why that is, I dont know, so I might either try out a different lightbox or abandon the idea for a while. Upcoming are more images (I shall shameslessly plunder some Wiki Commons in oder to provide some better maps), as well as an improved treatment of maps and images on the site. Even if I dont fix the lightbox, I will at least provide some frame around images and space for a proper caption. See you then! Duus, Masayo Umezawa. “Unlikely Liberators.” University of Hawaii Press, Honolulu; 1983. Hawaii Nikkei History Editorial Board. “Japanese Eyes, American Heart.” Tendai Educational Foundation, Honolulu; 1998. Interview with former member of 100th Inf Bataillon. The website of the 100th infantry Batallion also has a photo album by a member of the 1399th Engineer Construction Battalion. More on the 522nd Field Artillery Batallion can be found at the Densho Encyclopedia. The National Education Centre “Go for Broke” has extensive information on the contribution of US Soldiers with japanese ancenstry to the US forces during Second World War. When reading this or any document that has recorded the history of the Nisei in World War II, it becomes easy to believe that the exploits completed by these units are just as astonishing as any other military outfits but this conclusion would be incorrect. These individuals may have been equal to any other soldier on the battlefield, but when they joined together into their respective units they could complete astonishing goals unprecedented by any other military unit every to have served in the US military. These soldiers are to be revered as they have been, with more decorations than any other unit. They fought not only for their countries but for the respect and dignity their ethnicity deserved. Secretary of the Interior Ickes was correct when he said that the military units serving in the war helped change US opinion about Japanese Americans than any other factor. P.S. : To honor the outstanding achievements of the 100th Inf II I’d suggest its rating be changed from the current 1-8 to a 2-1-8. The unit was overstrength (six companies to the usual three or four) and from its many awards certainly deserves recognition for the great risks the soldiers of this unit were willing to take as well as the great feats they accomplished. Although the 100th and the 442nd were certainly the most famous US units made up of Japanese-Americans, the part that Japanese Americans played in the Military Intelligence service perhaps proved the loyalty of the nisei more than any other unit. For the Military Intelligence Service, established on November 1, 1941, was used to gain information on the Japanese Empire, by that time an obvious threat to the US military. Over six thousand Nisei were members of the MIS, all of whom graduated from the MIS College in Presido, California. The MIS nisei translated captured and covertly obtained enemy orders, battle plans, maps, diaries, letters, interrogated prisoners, deciphered enemy communications, broadcasted surrender commands, helped the US engage in psychological warfare, and even convinced soldiers and refugees in hiding to come out since the fighting was over (even if it wasn’t). Because of these actions and others still unknown to the public, the MIS should prove above any other organization that the Japanese Americans were loyal solely to the US during the war. Very little was known about the MIS until many documents cleared the fifty-year classification level in 1996. Much of the actions and directives of the MIS is still unknown as buildings of documents must be sifted through and even more is still classified, under lock and key. General Charles Willoughby, chief of intelligence in the Pacific, however, credits the MIS with saving millions of lives and shortening the war in the Pacific by two years. MIS Nisei participated in every campaign that involved Imperial Japanese opponents, including those in India and Burma, which did not involve US, troops. MIS Nisei worked with every major Allied nation including British, Australian, Canadian, New Zealand, Chinese, and Indian combat troops in every campaign in the Pacific. Many members of the MIS were found and began training even before the US was at war, but many were transferred from other areas of duty. Before the war, most Japanese Americans in the military were engineers due to technical experience, and many of these were transferred into the MIS, as well as many of those who initially had volunteered for the 442nd. Those in the MIS cannot be adequately honored as the members of the 442nd as many of their accomplishments remain secrets. The members of the MIS alive today still cannot discuss much of their experiences in the unit. But with General Willoughby’s comments in mind, it is obvious that the MIS lived up to the standards of the 442nd as well. The only all-Japanese American unit to serve in the Pacific Theatre during World War II was the 1399th Construction Battalion. The Chowhounds completed more than fifty-four major defense related projects during the war including the Flying Fortress airfield at Oahu and a million gallon water tank at Wahiawa still in service. When General Douglas MacArthur asked that the unit be used in the Philippines the White House refused his request, stating that they were essential to the defense of the Hawaiian archipelago. As it never actually participated in combat during the war, the 1399th Engineer Battalion stands in the shadow of the other Japanese American units which participated in the war. This, however, should not be construed as a slight on the 1399th, but rather a reminder of the fantastic exploits of the100th Infantry Battalion, the 442nd Regimental Combat Team, and the Military Intelligence Service. The 100th Battalion was originally formed up as the Hawaii Provisional Infantry Battalion and was made up of Japanese-American draftees from the island. The men were shipped surreptitiously on three separate trains – to avoid publicity: one through Texas, one through Nebraska, and one through North Dakota. On June 16, 1942 the trains arrived at Fort McCoy, in southwest Wisconsin. For the next three months the men slept in tents and were trained in military procedures – and they had an additional duty. Of the Japanese Americans arrested in Hawaii shortly after the attack on Pearl Harbor, 172 had been sent to Camp McCoy for internment beginning in March of 1942. When the 100th arrived at the Camp it was their duty to release the prisoners for exercise, an interesting predicament. Kenneth Kaneko, a soldier of the 100th, recalls that one of the prisoners was in fact the father of one of the soldiers of the 100th. Detaining other Japanese Americans was not the only strange position the members of the 100th were put in. When allowed on leave the local townspeople gave the soldiers cold stares and one local farmer, when he first saw a nisei soldier, called the state police and told them the Japanese had landed in the area by parachute. In November members of the Texan Second Division arrived at the Camp and after some name-calling fighting broke out. The Texans, much larger than the nisei, severely underestimated their opponents, and of the 39 troops which went to the infirmary that night, only one was a nisei, and that soldier had been beamed over the head by a Texan MP who was supposed to have been breaking up the fight. In what was perhaps the most atrocious circumstance in which the Nisei had to live, several were sent to an island in the Pacific and taught the dogs to hate Japanese by beating them. Despite this, the war cry of the 100th was “Remember Pearl Harbor.” Despite the obvious anti-Japanese connotations of this statement, the 100th wanted the Army to know where their loyalties lay. Soon the mistakes were corrected in Wisconsin at least and the community began bringing in the soldiers for dinner. The 100th was an orphan Battalion, and an overweight one at that. All battalions were attached to a Regiment or Brigade along with two or three others, but the 100th was the only battalion in the US Army without a parent, which indicated the military didn’t know what to do with the unit. The 100th also was oversized, having six companies to the usual four, and this also gave the implication that the Army had just dumped all of the Japanese-Americans in one unit and placed them in a corner somewhere where they couldn’t do any harm. The 100th even had Caucasian officers in command, although this was easily explainable as there were few Japanese-Americans who had undergone training to become officers. After some time, however, the unit was assigned to participate in maneuvers in Louisiana. Before leaving for the Deep South, Colonel Turner warned the unit that there were still ample prejudices against blacks in the South, but even this was not enough to prepare the men for their experience in Louisiana. 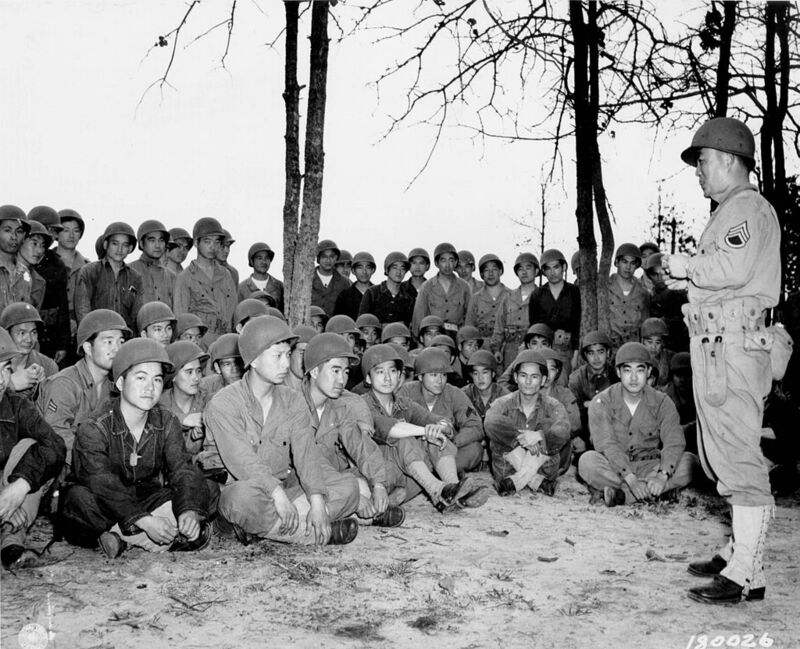 In the South the 100th participated in maneuvers with the 442nd Regimental Combat Team, a unit made up of Japanese American volunteers who were generally less well behaved than the men of the 100th. Although the prejudice against blacks surprised the 100th, it appalled the 442nd, who went so far as to get into fights and steal the public segregated busses that took them into town. From this experience, however, the 100th gained the reputation of a veteran unit, whereas the 442nd appeared as mere children to those in the 100th. After some time in Louisiana, the 100th returned to Hawaii where they visited old friends and organized baseball games before they were shipped off to the Mediterranean. On August 21, 1943 the 100th Battalion was loaded onto the James Parker, and was taken to Oran, the second largest port of Algeria in North Africa. The 100th’s orders were discussed for some time, as the leaders of the Allied forces knew not what to do with the unit. Eventually the 100th joined the Thirty-Fourth Division and was quickly accepted due to its baseball abilities. In fact, the 100th won the North African baseball tournament, beating every American team on the coast. Following the tournament the 100th landed on the shores of Italy, and henceforth was hounded by packs of reporters and journalists, eager to get the scoop on the unit. The engagements in which the 100th fought were some of the bloodiest of the war, but the soldiers proved themselves to be worthy of great praise. Although white men commanded them, it soon became obvious that the unit was indeed commanded by the enlisted men – and for good reason. Soldiers of the 100th proved themselves to be able leaders in battle, correcting their superiors on numerous occasions and eventually gaining the upper hand one the Caucasians were proven wrong time and time again. The 100th fought their first engagement before the sun rose on September 29th. Thanks to the ingenuity of a Korean-American lieutenant Kim the unit flushed out their first machine gunners nest with a banzai charge. In a second engagement soon after that day the unit approached some tanks on a road. Whereas the commanding officer commanded the troops to continue ahead on the road, Lieutenant Kim defied that order and took his men to the side of the road. Eventually the battalion commander had to promise the Lieutenant that he would take full responsibility for every man that died on that road. As the men approached the German positions, one died and seven were wounded. If Kim’s platoon had gone on the side of the road, it is very possible that none of those casualties could have occurred. In the beginning of October the 100th was to make a river crossing under fire during the night. The rainy season had begun in Italy and the weather was worse that autumn than it had been in decades. The 100th crosses the muddy river and was commanded in the wrong direction. Eventually Lieutenant Kim saved the day by finding the correct path to their destination after flushing out some more German machine gun positions. The Caucasian officers of the 100th were known not to stick their necks out, and always allowed the Nisei to lead, perhaps in more ways than one. It is this fact, along with the bravery and skills of the Nisei, which have given such high honors. Perhaps the most daring feat of the 100th, however, was their assault on Cassino. Monte Cassino was a monastery built on the peak of a mountain and was perhaps the most impenetrable spot militarily in the entire Italian boot. After crossing a river of mud in the dark under fire, the remaining members of the 100th had to clean up machine gun post before moving on despite the mud everywhere. Through the minefields they went on approach to the mountain. Unfortunately, the other regiments of the Thirty-Fourth Division had been completely repulsed by the Germans and had not made it across, and so the 100th had to retreat. Their entire day, advance, and their numerous losses were for naught. 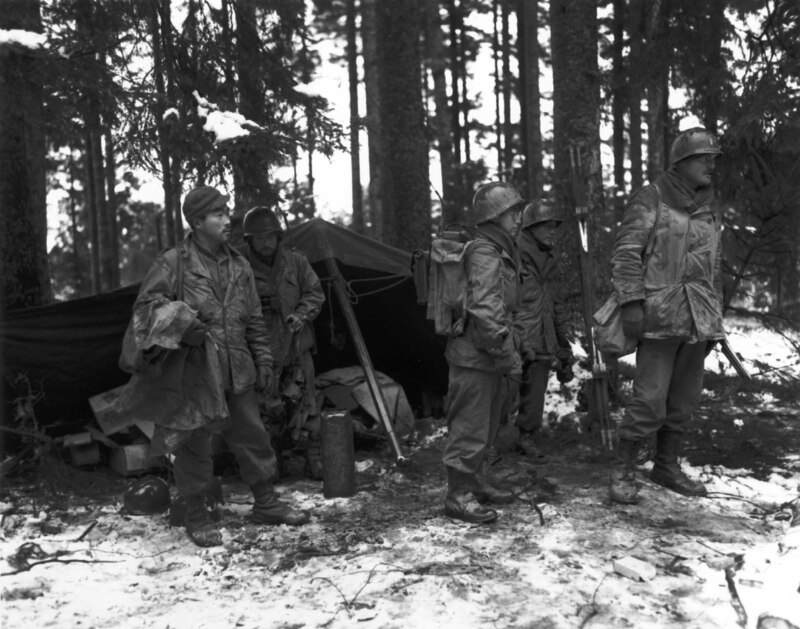 On February 8, 1944 the 100th once again made an assault on the mountain, but was again forced to retreat, as other units could not reach their objectives. The assault on Monte Cassino is the most famous engagement (engagements lasting 1 to 5 days) of World War II (at least to US historians) with the single exception of Guderian’s attack on Sedan. The first Japanese-American POW was taken by the Germans at this time, and he and every soldier of the 100th and 442nd were treated with respect and dignity by the Germans, although they were often why they were fighting for the Americans and not Japan. Monte Cassino also saw the first cases of shell shock among Nisei soldiers, which was much less common than in Caucasian units. After the raids on Cassino, the 100th was pulled back to regroup as it had been heavily depleted by this time. After a few weeks of rest the 100th had another nearly impossible chore. The American landing at Anzio was perhaps the riskiest maneuver of the war. The Germans sent their best tanks and most elite soldiers against the beachhead, but the Army, including the 100th, held out. Make no mistake; the story of the 100th is not similar to any other’s. The 100th was placed in the most difficult positions the US could find for them and was even under one of the ten worst generals of all time, General Mark Clark, as according to West Point’s Officer’s Companion to Military History. After Anzio the 100th was continuously manning the front lines in a push for Rome. Until, that it, they were near the city. The 100th was ordered to halt just before Rome so the rest of the US Army could claim the glory. Following a short stay in Rome, the 100th was attached to the 442nd. On February 23, 1942, Japanese American students on Hawaii were allowed to form the VVV (Varsity Victory Volunteers), which was intended to be a military unit under the US Army by its members. However, the unit was merely attached to the US Army Corps of Engineers and quickly became a manual labor unit. The Japanese Americans on Hawaii continually pleaded to be allowed to participate in military operations. Part of the reason was to protect their country, but also they wished to prove themselves, as many other Americans pointed out how they had not operated in the military in significant numbers and so weren’t to be trusted. After over a year of pleading the volunteer Nisei were granted their wish. On February 1, 1943 President Roosevelt announced that the 442nd Regimental Combat Team was to be formed of Japanese Americans. Many members of the VVV had not appreciated how the US had treated them, but plenty others – twice as many as expected in fact – volunteered for the 442nd. The men of the 442nd were hardly the top-notch trainees of the 100th. They found beer, women, and gambling for the first time in their stint in the military, and were shunned by the 100th when the two units met for the first time on maneuvers in Louisiana. The 442nd was also troubled by internal rivalries, as it was made up of both Hawaiian volunteers and mainland Japanese Americans. Fights broke out constantly inside the unit. These difficulties only escalated once those entered the unit from Japanese internment camps. When the 442nd was sent to the front, however, the situation changed greatly. The 100th was attached to the 442nd and so took on a leadership role due to its members advanced age and superior training and experience. The other members of the 442nd, however, were there to prove themselves. At a request from the men of the 442nd, the volunteers would be committed to battle while the 100th would be held in reserve during the first engagement of the 442nd. After each battalion of the 442nd is tied down in a German trap and the General of the 442nd is almost captured, he commands Colonel Singles, leader of the 100th, to, “clean up this mess.” During the next three hours the 100th killed at least 178 enemy soldiers, wounded 20, captured 73, and also captured 44 enemy vehicles to only four dead and seven wounded of their own, leaving the enemy in a rout. This was the engagement that earned the 442nd its first presidential citation. Its second would not be far behind. In another amphibious assault, the US Army landed in southern France. The 442nd was to take Hill A. Hill A was a small bluff covered in trees south of Bruyeres, France. First a smoke screen was laid down to protect the 100th who approached the wooded bluff from a field. Then the artillery barrage began. During each let-up of the barrage, two members of the 100th, Lieutenants Kim and Takahashi stepped out of the smoke screen and beckoned the Germans to give up. Each time they did this they risked their own lives by exposing themselves to the Germans in the forest. Eventually, however, the Germans surrendered at the beck and call of these men, and all that was left was to charge up the empty hill. The other battalions of the 442nd took Bruyeres as well as 143 surprised prisoners. It was this action that gained the unit its second presidential commendation. For months the members of the 442nd Regimental Combat Team, in particular the men of the 100th Battalion, pushed through the Vosges Forest and beyond of southern France, sustaining incredible casualties and making a name for themselves. When they had initially been transferred to the front, no one wanted these units in their outfit, but now every commander wanted to command the 442nd. Colonel Singles, the leader of the 442nd for most of its existence admitted that his post was perhaps the most envied after next to Eisenhower’s or Patton’s in the United States Army. Following the fall of Rome the 100th was asked to lead a victory march three times when the usual precedent had been set at only one per unit per war. These marches, however, were not the only recognition of the Niseis’ work during World War II. The 442nd and the 100th has the record for the most unit and individual awards than any other units of comparable size in any branch of the military service for the United States of America. At its peak strength the 442nd Regimental Combat Team had about 4,000 enlisted men and 225 officers, and throughout the war the unit received almost 6,000 decorations. Posthumous decorations and numerous awards following the war has historians estimate that over 8,000 men of the 442nd have been awarded a decoration of some kind, with the majority of those awarded decorations having more than one, for a total 18,143 decorations for bravery and 9,486 Purple Hearts. Of these decorations, seven were presidential citations, the highest award a military unit can receive, and five of those seven were awarded for the two weeks the unit fought in the Vosges – an unprecedented number in such a short time period. Following the war the 442nd held the honor of being the only military unit among those returning from overseas battles to be reviewed by the president. The 442nd was clearly the hardest working unit in the US military, which was reflected in the general Japanese-American public. The proportion of Japanese Americans who served in the US military in World War II was higher than any other group. Following the rescission of executive order 9066, under which Japanese Americans on the US mainland where sent to relocation camps, Secretary of the Interior Harold L. Ickes wrote to Colonel Miller, then the commander of the 442nd, “The members of the combat team have made a magnificent record of which they should be proud. This record, without doubt, is the most important single factor in creating this country a more accepting attitude towards people of Japanese descent.” But things were not idyllic for the Nisei who returned to the US from battle. Some, such as Sergeant Kazuo Masuda, were kept from entering their homes due to their Japanese descent. In Hood River, Oregon, sixteen Japanese Americans were taken of the Honor Roll of the local American Legion Chapter. Following the war reintegration was slow, but the Japanese Americans showed the same skill and drive back in the states as they had in battle. The law that prevented the naturalization if Japanese immigrants was repealed in 1952 thanks to the efforts of many Nisei officers who had served in the 442nd. In 1968 a bill was passed which banned the creation of any future relocation camps. Thanks to their incredible war record, Japanese Americans were gaining a foothold on American politics by the 1950s that continues, particularly in Hawaii, to this day. Former US Senator Spark M. Matsunaga (Sen. 1976-1996), for example, served in the 100th Infantry Battalion. The GI Bill also allowed Japanese Americans to get a professional education, and since Japanese Americans had entered the armed services at a higher rate than any other ethnic group their prosperity rose dramatically.